San Francisco: When gas spiked at well over $3.00 per gallon many commuters started looking around for more economical transportation. The Japanese automakers saw the need and quickly re-engineered vehicles not originally intended for North America in order to fill this need. 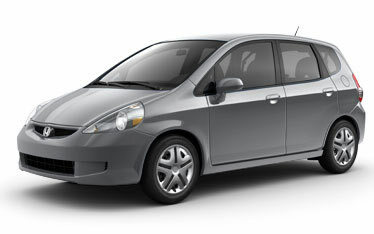 One of the most prominent was the Honda Fit. Like the true investigative automotive journalist that I am (and desperately in need of frugal transportation) I put a Fit through its paces at my secret test track (my 70 mile round trip commute to work and home). Styling being in the eye of the beholder, I found the Fit, a kind of mini-station wagon, pinched, just a tad too narrow and tall, yet a tad whimsical. Being a mini-station wagon, the Fit is versatile; there is 21.3 cubic feet of storage behind the rear seat, and when that is folded there is 41.9, a huge amount of room for such a small vehicle. The Fit is only 157.4 inches long, 66.2 inches wide, and 60 inches tall. Five people will fit inside, although with 50.6 inches of shoulder room in the rear they better be three skinny people. The Fit’s engine is a 1.5-liter, four-cylinder, 16-valve, SOHC that produces 109 hp and 105 lb.-ft of torque that drives the front wheels through a 5-speed manual transmission. A 5-speed automatic is an available option. I drove a manual transmission version, which was the normal Honda smooth and easy. The Fit, even a base Fit, is well equipped. I am getting older and I do appreciate things like power windows, door locks, and outside mirrors, air conditioning and a 160-watt sound system. The Fit Sport adds as cruise control (a must have for me), and an upgraded 200-watt sound system with MP3 player capabilities. The Fit did have its cost-cutting measures. Take the carpet - Please! I have never seen a carpet this cheap since carpets became standard. It looked and felt like carpet under-pad. The plastic trim was on a par with what Honda used maybe ten years ago, good but not great for 2007. But heck, the Fit is not about its luxuriousness right? It is about its frugality. And frugal it is, using only one gallon of fuel for every 33-city miles or 38-highway miles with a manual transmission. The city figure dips to 31-miles with the automatic but stays at 38-highway. So I used less than two gallons of gas on my round trip commute! Do not expect the Fit to be a rocket though. I found that I needed to run the engine up to just about redline for decent acceleration and to downshift into fourth when passing. I was pleasantly surprised by the ride and handling of the Fit Sport I drove. It was shod with P195/55 R15 tires (the base Fit uses P175/65 R14s). The heaviest Fit only weighs a tad over 2,500 lbs., so you might expect the suspension to be a little stiff (trying to engineer a suspension for a load variation of at least half the vehicles weight is no easy task), but it was not. Likewise the handling of a car this tall and narrow often gives the driver a tipsy feel, which can be aggravated by a high seating position. It did not happen, in fact the Fit kind of felt like I was driving a Civic wagon from the early ‘90s. The Fit and other “super-economy” cars mainly from Japan have the domestic automakers scrambling, and rightfully so. In the blink of an eye Honda brought the Fit into compliance with our emission (getting a LEV-2 rating) and safety regulations, and brought it to market. I doubt that the actual sales numbers, 20,302 from its April ’06 introduction to the end of September ’06, had the domestics cringing with fear, but the speed of the response itself might be worrisome. That and the fact that Honda is able to make a profit on such a low priced vehicle. How low is the price? The base Fit five-door lists for $13,850, and the Fit Sport climbs to $14,650. If you add every option available including an automatic transmission you can get the price up to $18,828, at which point you are into Civic territory. Be judicious and you can have a very well optioned Fit Sport for around $16,000.